Here’s a quick and easy way to jazz up pork chops! Heat oil in large skillet on medium heat. Add chops; cook 4 to 5 min. on each side or until done (160°F). Transfer chops to plate, reserving drippings in skillet; cover to keep warm. Add broth to skillet; stir to scrape up browned bits from bottom of skillet. Stir in remaining ingredients; cook and stir 5 min. or until thickened. Spoon half the sauce over chops. Serve remaining sauce on the side. 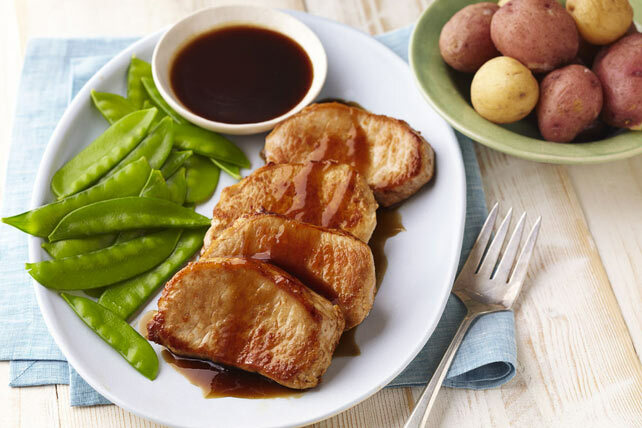 Serve with hot cooked new potatoes and steamed snow peas.